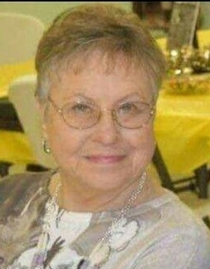 Katherine Marlene Moose, formerly, Marlene Schumacher, age 79, of Woodsfield, Ohio passed away on June 28, 2018 at her home. She was born on September 21, 1938 in Hillsville, PA, the daughter of William N. Moose and Sophia E. (Hoff) Moose. She was proceeded in death by her father, William N. Moose, mother Sophia E. (Hoff) Moose, sister Barbara Moose, sister Janet (Marlyn) Hines, Louis H. Schumacher, Jr., and dear friend Helen McIntire Dougherty. She is survived by her loving husband of twenty years, Richard T. Moose, her brother Arthur (Dr. Vicki Whitacre) Moose, children: Mitchell (Ashley) Schumacher, Perry (Deborah) Schumacher, Kristel (Wayne) Smith, Lynda (Christopher) Keylor, and Paul "Pete" (Kristi) Schumacher. She is survived by her step-children: Stacie Moose, Andrew (Sharri) Moose, Angela (Tim Bentz) Moose, Cynthia (Gerald) Walters, Sandra Moose (deceased) and Timothy (Julie) Moose. In addition she is survived by the light and joys of her life, her grandchildren: Allison Schumacher, Douglas Hauck, Chelsey (Kody) Skinner, Andrew (Lynsey) Schumacher, Zachary (Riley) Keylor, Jordan Schumacher, Isaiah Schumacher, and great grandchildren: Remmy Skinner and Kolson Skinner. She also wanted to recognize the step-grandchildren and step-great grandchildren who became part of her life through marriage to her daughters, Kristel Smith and Lynda Keylor: From Col. Wayne Smith, USA (ret), Tracy (Greg) Smith and their daughters Ava and Penelope and Laurie Smith and her son Brayden. From Christopher Keylor, Erik Keylor and Courtney (Aaron) Woollard and their daughters Harper and Sydney. From her husband Richard's daughter Angela Moose, her son Zebulon. From his daughter Cynthia Walters, her daughters Kayli, and Bethany and son Nicholas. Also a step-great grandson Benjamin. Additionally, she wanted to recognize her beloved nieces, nephews and grand nieces and nephews who meant the world to her. Because of her love for them she felt blessed with being a beloved Aunt. Marlene was a 1956 graduate of Woodsfield High School. Marlene's first employment opportunity was selling tickets and popcorn at the Monroe Theater. She began working at the Woodsfield Savings & Loan in 1959. She became manager in 1980 and retired in 1989. Subsequently, she was employed as a Senior Quality Assurance Analyst at JP Morgan Chase in Westerville, Ohio until 1999. Marlene began a concentrated effort pursuing art at the age of 70. She became actively involved with the Monroe Arts Council for over a decade where she served as president for four years. Under her leadership, the organization acquired the current building that houses the Monroe Arts & Visitors Center. Additionally, in 2016, she was instrumental in securing the Monroe Theater for the Monroe Arts Council. She was a member of the Woodsfield Presbyterian Church for twenty years, serving as an Elder. She also served as Treasurer of Session for 5 years before returning to the Catholic Church. She was a member of the Order of Eastern Star, serving as Chaplain for five years. She was also a member of the Monroe Singers and the Switzerland of Ohio Garden Club. While Marlene will be remembered for her contributions to many organizations over her lifetime, her greatest legacy will be the time and love shared with those whose lives she touched, influenced and nurtured. During her final months she was blessed with time spent with so many of her family and friends, that she knew she was truly loved. Friends will be received from 2 to 8 on Monday, July 2, 2018 at Bauer-Turner Funeral Home, 100 S. Paul St., Woodsfield, Ohio. Mass of Christian burial will be held at St. Sylvester's Catholic Church, Woodsfield, Ohio at 11:00 a.m. on Tuesday, July 3, 2018. Burial will follow at the Miltonsburg Cemetery. Marlene made it her wish that memorial contributions be made to the Monroe Arts Council. Donation Cards will be made available during calling hours and before the time of service. Also contributions can be sent to Monroe Arts Council 118 South Paul St., Woodsfield, Ohio 43793.